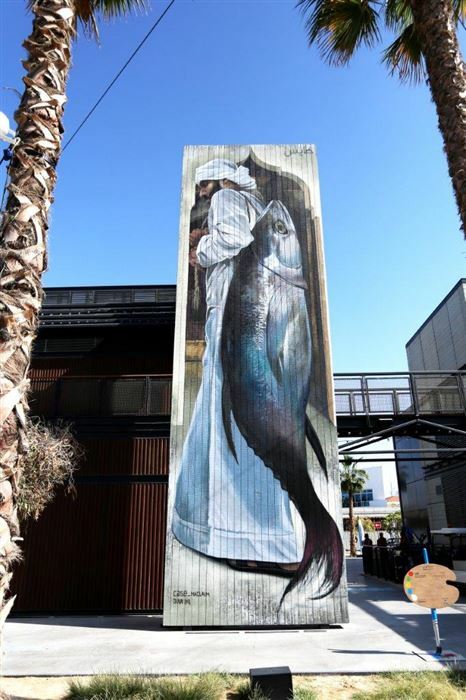 Organisers of the annual public art festival Dubai Canvas today revealed that 15 street-art works displayed at this year’s event will become permanent exhibits at La Mer, Meraas’ beachfront destination. Over the last seven days, La Mer was transformed into an ‘open-air canvas’ for some of the world’s best street artists to create their works. As the venue for this year’s Dubai Canvas, organised by Brand Dubai in partnership with Meraas, La Mer displayed the creations of over 30 street artists from around the world. Brand Dubai and Meraas are partnering for the third time to bring the annual Dubai Canvas Art Festival to the public. The latest partnership is part of the ongoing collaboration between the two organisations to help realise the vision of the Vice President, Prime Minister and Ruler of Dubai, His Highness Sheikh Mohammed bin Rashid Al Maktoum, to transform Dubai into an open-air art museum. Chief Malls Officer at Meraas Sally Yacoub said: "Meraas has championed art, creativity and urban culture throughout its destinations for a number of years. During this time, appreciation for modern and contemporary art has grown as the Dubai community has had the opportunity to engage with world-class artists, exhibitions and events. In partnering with Brand Dubai to bring Dubai Canvas to La Mer, our aim is to engage our visitors, and we are confident that they will be fully involved this year with the interactive pieces by global artists and the workshops held during this edition." Project Manager of Dubai Canvas Ayesha bin Kalli said: "Meraas is the ideal partner for Brand Dubai in our efforts to develop the artistic and creative landscape in Dubai. Meraas’ unique destinations provide the ideal atmosphere for bringing the public together to celebrate art, creativity and innovation. These destinations truly represent Dubai’s cosmopolitan and creative spirit, which makes the city a distinctive venue for global art events. Public interaction is very important for street artists, and the artists participating in Dubai Canvas have found these destinations the perfect settings, not only to create their art but also connect and engage more closely with the public." Last year, Meraas’ urban destination City Walk provided an inspiring setting for leading 3D artists to create and display their artworks at Dubai Canvas 2017. Brand Dubai previously also partnered with Meraas to organise the first Dubai Canvas held in 2015. This year’s exhibition featured a range of unique art forms, including graf?ti spaghetti, object art, inflatable art and tape art, in addition to 3D art. The family-friendly exhibition also featured a number of entertainment activities and a range of art workshops conducted by leading artists and art organisations.